Verreaux's Eagle Owls (Bubo lacteus) - also known as the Giant Eagle Owls or Milky Eagle Owls - are the largest owls found in Africa and are said to be world's third largest owls (the largest being the closely related Eurasian Eagle Owls and the Blakiston's Fish Owls). 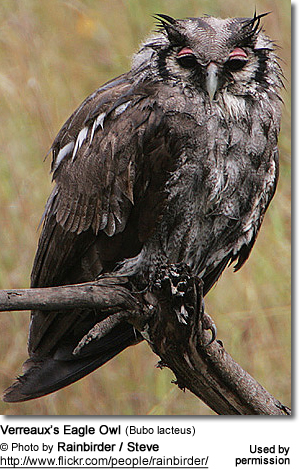 With a wingspan of up to 6.5 feet (2 meters), they are, arguably, Africa's most impressive birds of prey. 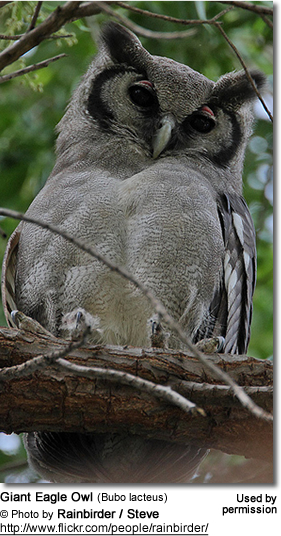 These nocturnal birds mostly hunt at night and during the daytime roost in tall trees. Verreaux Eagle Owls occur naturally in western, central and southern Africa, from sea-level up to an altitude of 6,500 feet (2,000 meters), and occasionally up to 9850 feet (3000 meters). They have a patchy distribution from Senegal and central Mali east to Cameroon, and from central Sudan, northern Ethiopia and Somalia south to South Africa. They are believed to have formerly occurred in Lesotho, but are now considered extinct in that country. They are resident (non-migratory) in much of their range. Even though they have a wide range, they are uncommon and their numbers appear to be in decline. The Giant Eagle Owls occupy a number of different habitats, including dry savanna with scattered trees, open or semi-open woodland and grassland, and agricultural land - often near water, such as rivers, marshes and floodplains. They are generally absent from bare desert, dense woodland and tropical rainforest. The Giant Eagle Owls are very large owls that measure between 26 - 28 inches (66 - 71 cm) in length and have a wingspan of up to 6.5 feet (2 meters). The substantially larger female weighs between 5.5 - 6.8 lbs (2.5 - 3.1 kg) and the male between 3.5 - 4.2 lbs (1.6 - 1.9 kg). In addition to being larger in size, the female can be identified by the rounder facial disk. The plumage is reddish / greyish-brown in color - darker with pale vermiculations (wave-like markings) above - and light grey with dense fine barring below. They have a whitish oval disk face with a black border, distinctive pink upper eye lids, feather tufts on their ears, and barred flight feathers. Immature birds have white patches on the head and a sooty barring over the body. 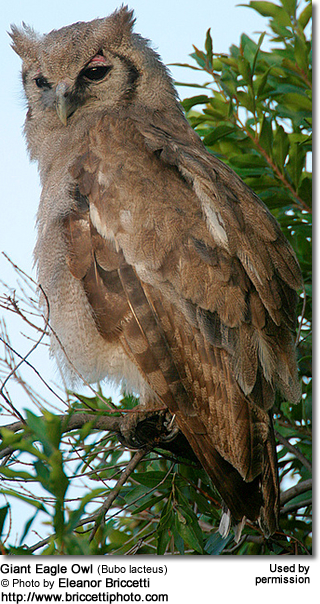 Giant Eagle Owls feed on mammals, such as rats, hares, mongooses, monkeys, hedgehogs and hyraxes - and in urban areas are known to decimate cat populations. They also take larger birds, such as pigeons, guinea fowl, flamingos, herons and birds of prey - including other eagle owl species. Birds are often captured in the air. They will also prey on reptiles, frogs, invertebrates and fish. They will wade into water to catch fish. 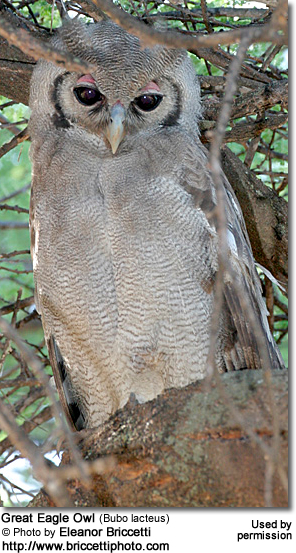 Verreaux's Eagle-Owls are generally opportunistic feeders and will readily scavenge for leftovers and eat carrion. These nocturnal birds typically hunt early evenings or at night. Most breeding activities are observed from March to October, with timing varying between locations. They often take advantage of preexisting stick nests constructed by other large birds, such as vultures, and Hamerkop / Hammerhead Storks and Secretary Birds. However, records exist of them nesting in tree cavities or tangles of creepers and orchids. The average clutch consists of 2 eggs, which are incubated by the female alone for about 38 days, while the male hunts for food for the nesting female and the young. At those times when food is not plentiful, the parents will only feed the first (larger) chick and the second chick often perishes within 2 weeks. The surviving chicks fledge (leaves the nest) when they are about 9 weeks old and are able to fly well a couple of weeks later. Even though they are independent (able to feed themselves) when they are about 6 months old, they remain with their parents for up to 2 years. Their calls are described as a sequence of deep, nasal grunts.